I've been an avid reader of newspapers. I admit I don't read the entire paper from beginning to end but I do scan all pages including ads. I guess growing up in a household which had the morning newspaper readily available almost everyday influenced me to appreciate newspapers. So you can understand my joy previously working under Public Affairs when we had all the major dailies available at our dispense. Even if my job required monitoring news online and via social media, I'd always try to take a glimpse of the current newspaper from time to time. When my family and I moved to Singapore, I was delighted to find out that some newspapers were distributed at convenient commuting locations for FREE! So part of my daily habit was to pass by the nearest MRT station to get the current newspaper. Here was where I was introduced to My Paper. It wasn't that thick and there was a section in Chinese so as much as I enjoyed reading it, I felt it lacked my morning literature. 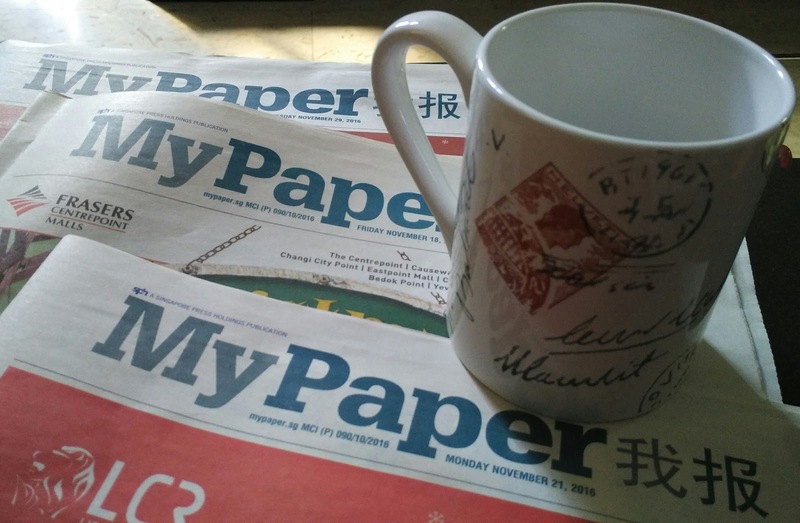 Now, I just found out that The Paper's last publication is today, November 30 2016. But before I could sadly react, I immediately discovered that My Paper will merge with The New Paper (TNP). And The New Paper will be available for FREE starting December 1, 2016 at MRT stations, selected malls and other locations such as cafes, medical centers, country clubs, car service centers, premium buses, airline lounges and serviced apartments. The new publication will be purely in English catering to professionals, managers, executives and businessmen. The thicker form will also offer daily themes like food, fashion, health and movie features. I wasn't here to witness My Paper's early beginnings over a decade ago, and I'm not familiar with TNP even if it started publications way back in 1988, but I'm excited to see this history in the making and ready to pick up the very first edition of the new TNP tomorrow. Congratulations to The New Paper!